It's easy to go negative when talking about membership in volunteer organizations, but that's not us. In the grand scheme of things, Rotary is doing okay! In fact, in parts of the world, people are lining up to get into our organization! One could argue that declines are NOT due to people wanting to volunteer less, but rather to a diversification of how people can volunteer. That's why we are always telling clubs to get creative to attract new members. -The three things that Rotarians value most are community service, networking, and friendship. If they don’t get those things from Rotary, they might leave. More former members left because of their club than because of Rotary overall, so make sure your club is delivering value to all members. -58% of leads (people asking to join at rotary.org) are never contacted - don't be those clubs missing out on "free" members! Click here to download this powerpoint presentation. Be sure to customize it because there are some fill-in-the-blanks you should do first. Also, you could add a slide with information about your club's membership. You can look at your club's trends in the goal center of Rotary Club Central (accessible to your membership chair, president, secretary and executive secretary) at rcc.rotary.org. You’re nearly midway through your year. Is your club making a difference? Is it strong, vibrant, and growing? Are your members engaged and satisfied with their club experience? If the answer is no to any of these questions, there’s still plenty of time to make a positive change in your club’s future. Rotary has eight new membership-related courses available in the Learning Center. Each course includes a variety of materials, including self-guided learning modules. The interactive modules present real-life scenarios that let you test different actions to see what happens. • Is Your Club Healthy? To decide which areas to focus on, start with the course Is Your Club Healthy? Ask your membership committee to help you prioritize the course areas, then begin exploring. The courses are free and available on demand, so you can take them at your convenience. Members can access the courses in the Learning Center after signing in to their My Rotary account. You’ll find the Learning Center under Learning & Reference in the menu. In the Learning Center, select the Membership category along the left side of the page. or log on to My Rotary at rotary.org, go to Newsletters and sign up to receive the Membership Minute! What you can dream, you can create. What you can dream, you can be. Want to give something to new members when they join? The new Rotary Basics offers an overview of all things Rotary. 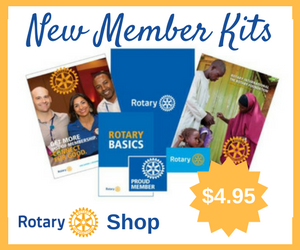 It includes information for all Rotarians, especially new members who are interested in our history and values, plus a Rotary glossary. If you need ideas for getting new Rotarians involved and giving them a meaningful experience, look to Introducing New Members to Rotary: An Orientation Guide. Don’t forget to check your district or club membership leads page. If you have any outstanding leads, follow up on them and update their status online. The Managing Membership Leads webinar shows districts how to use this tool and provides best practices for clubs. Since it started in December 2015, the membership leads program has resulted in thousands of new Rotarians by routing prospective members to districts, then to clubs. Rotary International made an important change that could affect your club’s membership figures. If you have new members you wanted counted in your membership achievements for this Rotary year, they must be reported to Rotary on or before June 30th. ● Members added with July 1 effective dates will no longer be included in your new Rotary year membership start number, but they will be billed on the July club invoice and counted toward membership growth for the year. ● Members terminated with effective dates on or before July 1 will reduce your club’s membership achievement for this year, reduce your July 1 membership start number, and will not be counted in the July club invoice. We hope this simplifies your reporting and reflects your membership more accurately. Do you have new club members? If so, please share their names and contact information with our District 7150 Membership Chair, PDG Deb Glisson. Deb would like to welcome and share updates regarding new members to our District! 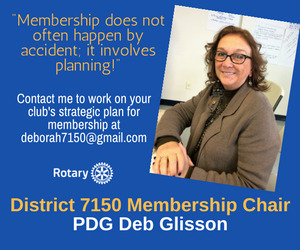 Any questions relative to membership may be forwarded to District 7150 Membership Chair - PDG Deb Glisson at deborah7150@gmail.com. You can also reach out to your Area Membership Coach for one-on-one assistance or to address your club on the importance of everyone participating in membership efforts!